The global sustainable packaging market is highly fragmented due to the presence of numerous local, regional, and multinational players. The competition among the small local and regional players is high on the basis of cost and products provided by them. 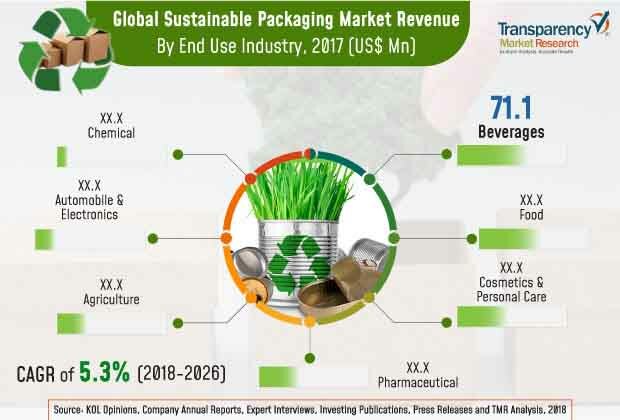 Some of the prominent leading players in the global sustainable packaging market are Ardagh Group S.A, Gerresheimer AG, Smurfit Kappa Group PLC, Ball Corporation, WestRock LLC, and Crown Holdings, Inc.
As per TMR, the global sustainable packaging market was US$250.6 bn in 2018. The market is expected to rise at 5.3% of CAGR by volume during the forecast period between 2018 and 2026. Based on type of material, the paper and paperboard segment is expected to dominate the market as it held 55.1% share in 2018. This segment is projected to dominate the market over the forecast period. Furthermore, the plastic segment is projected to rise at 5.0% CAGR during the forecast period. Based on geography, Europe is leading the market by holding largest share on the account of high concentration of the packaging manufacturers and high disposable income of the consumers. Europe is followed by North America with the highest per capita consumption of packaging. Among the developing regions, the Middle East and Africa are expected to grow and mark its contribution in the global sustainable packaging market during the forecast period. Globally, the awareness for environmentally friendly packaging solution and lesser use of plastics have grown significantly, thus, it is considered one of the major factors for growth of the sustainable packaging market. As the use of non-biodegradable plastics causes harmful effects on the surroundings such as landfill, soil pollution, and reduces the fertility of soil, therefore to minimize these ill effects the use are focusing on using sustainable and environmental-friendly packaging solutions. In addition, several governments across the globe have imposed strict laws to minimize the use of material that is not eco-friendly, thus, these laws have also boosted the demand for sustainable packaging solutions. Considering the abovementioned, factors are projected to fuel demand for sustainable packaging solutions, which in turn flourish the global sustainable packaging market. Additionally, changing lifestyle has increased the need for packaged products. This is because more and more users are now buying packaged food and beverages products that have increased the amount of plastic in the environment. However, to meet the packaging needs, alternative ways are being innovated, especially for sustainable goods. These are not just meant to meet the demand for packaging but are environment-friendly as well, along with being able to reduce the landfills. On the other hand, some factors may restrict the global sustainable packaging market from growing. Low accessibility and the high cost of raw material, when compared with the inexpensive material, are restricting the market growth and decreasing the demand for sustainable packaging solution. The raw material is used for sustainable packaging, includes bio-based monomers, bio-polymers utilized in films, barriers, recyclable and cellulosic fiber, liquid biofuels, and additives are quite expensive that are hampering the growth opportunities of the sustainable packaging market globally.